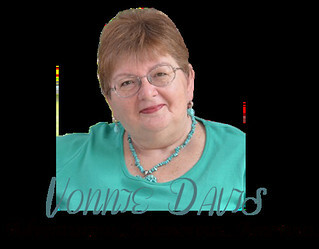 Today I welcome the lovely Vonnie Davis to get us in the mood for the Holidays! Thanks for allowing me to share briefly about my Christmas novella, Katya. It released on Thanksgiving Day. Enter Dan “Wolf” Wolford aka the man-whore next door and the new star of Becca’s popular, post-divorce blog about men. A Navy SEAL turned commander of the Florida Marine Rescue Unit, Wolf’s the very definition of the word alpha – and with an endless rotation of women on his doorstep, this hunk on a Harley has Becca and her female followers all hot and bothered! Just then his door opened, and man-whore stepped out on his small front porch. In a purely feminine reaction, Becca reached to smooth back her hair. Suddenly, Einstein wrenched his leash from her grip and took off. “Einstein! Einstein, stop!” She sprinted after her errant dog. Her neighbor pivoted. Einstein leaped, knocking him back against the door. “Whoa, there big guy!” He accepted the canine kisses and aimed dark eyes at her. “Is he yours? He’s some dog.” His large hands ruffled Einstein’s fur. Firm biceps flexed under her neighbor’s black Harley T-shirt, and the bottom of a wicked tribal tattoo peeked from beneath his right sleeve. No doubt one dog recognizes another. had one dimple was the singular flaw on his flawlessly handsome face. Now that she was within five feet of him, she could clearly examine his features. Having watched him through her window from time-to-time, she knew he was tall and muscular. But up close, she realized he had the body of a serious weight lifter. His long, dark brown hair was brushed straight back. The skin crinkled at the corners of espresso-colored eyes when he smiled, which he seemed to do easily and frequently. Yet, it was the vision of him holding a cat named Fluffy that nearly made her smile. Muscle man and putty cat. “You live next door, don’t you?” He jerked his head toward her home. I’ll just bet they do. “Wolf, please.” His large paw enveloped hers, and warmth spread upwards from her stomach, did a backflip and then dove downwards. Meanwhile, his dark gaze assessed her entire body and face, as if she were the most dazzling woman in sweaty running clothes he’d ever seen. His solitary dimple winked along with his thousand-watt smile. One dark eyebrow rose as if he were waiting for her to share her name. She wasn’t sure why she hesitated. She was reluctant. Fueled by his cocksure attitude, no doubt. Now there was a cliché, if ever she’d heard one. His thumb rubbed slow, lazy circles over her knuckles detonating sensual signals straight to her core. Oh, he was good at this magnetism stuff. Want to know more about Vonnie? Thanks for having me, Katya. I thought I’d commented earlier, but I don’t see it. Maybe you’ll have me back in August when my paranormal releases from Random House. I have a wild story of how the hero–a Scottish bear-shifter–came to me.